Intermatic EI600 Series 3-Way heavy-duty digital programmable timer in ivory color, is rated at 120 - 277-Volt AC and 12 - 28-Volt DC. It features On/Off action. It has contact rating of 20-Amps at 120 - 277-Volt AC resistive, 16-Amps at 120 - 277-Volt AC inductive, 15-Amps at 120-Volt AC and 6-Amps at 208 - 277-Volt AC incandescent load rating. Timer has maximum breaking capacity of 1 hp at 120-Volt AC and 2 hp at 240-Volt AC motor. It has timing range of 24 hours/7 days. Timer is suitable for indoor/outdoor lighting, entryway lighting, deck light controls, landscape light controls, attic fans, pumps, hallway lighting, small commercial signage and store lighting. The CR2 lithium battery offers a minimum 2 years of time keeping without AC power. It measures 44.5 mm x 46 mm x 104.8 mm. 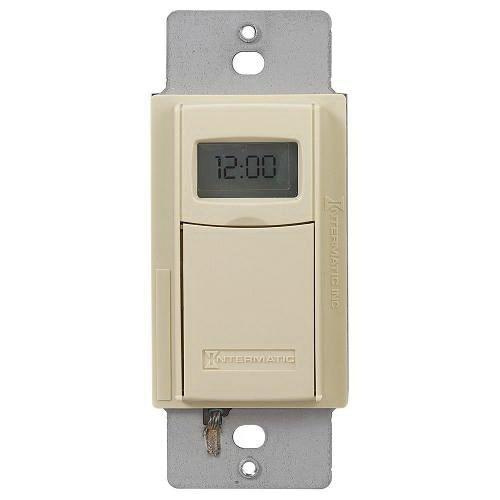 In-wall mountable timer withstands temperature rating of 0 to 40 deg C. Timer is Title A20 listed and CSA certified.